Although a three-point shootout had been present in games like Jordan vs Bird and NBA All-Star Challenge, they weren’t the best representation of the event. The contest in Jordan vs Bird only featured Larry Bird (just as Michael Jordan was the only player available in the dunk contest), and manually running between the racks was awkward, since Bird didn’t automatically lock into position. Similarly, the shootout in NBA All-Star Challenge was hampered by poor shooting mechanics, specifically the need to press the shoot button to start the shot, then again to release it. There wasn’t a noticeable difference between the skills of the competitors, either. As such, those early takes on the three-point shootout don’t hold up particularly well. 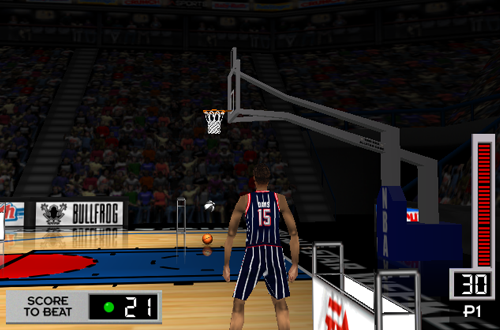 In contrast, NBA Live 98’s contest is still very playable. Two key improvements over its predecessors were the ability to select any player in the league, and the presence of individual three-point ratings. This meant that there was a noticeable difference in performance, with the top rated shooters being much easier to tally high scores with. The CPU was also affected by the player ratings, so if you selected Reggie Miller and then chose Shaquille O’Neal for the CPU, there was no way that it was winning unless you really messed up during your round. The mechanics were also noticeably better than in previous games. Your player would automatically run between racks and position themselves accordingly, with the only manual controls being pick up the ball, and shoot. This meant that no time was wasted trying to line your player up with the rack in order to be able to attempt all of your shots without any issues. Shooting followed the same principle as taking jumpshots in regular five-on-five gameplay: release the ball at the optimal point (i.e. at the top of your jump), with a combination of your release timing, the player’s three-point rating, and the difficulty setting determining the likelihood of making the shot. 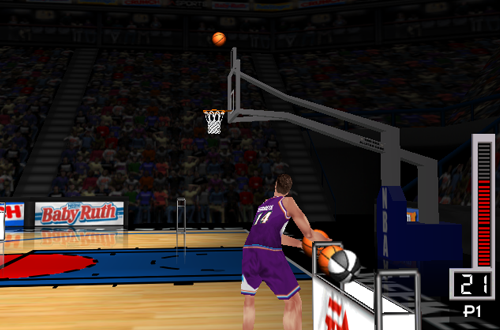 Unlike the fixed midcourt angle in previous games, the camera in NBA Live 98’s three-point shootout was situated behind the player, following them as they ran to each rack. Not only did the close-up camera angle help master release timing, it was also much more reminiscent of the presentation during the real three-point shootout at the NBA All-Star Weekend. The event also had its own music, a memorable drum beat that played while players were shooting. It too was quite reminiscent of the music that would often be played in the arena during the real contests, adding to the atmosphere. Overall, it was very well done, given the tech of the era. Indeed, the only real drawbacks of the mode were the same ones that were found in the shooting mechanics in regular gameplay. While the concept was simple enough, jumpshots were never quite as effective as they should’ve been in the early days of basketball video games. Without a shot meter or visual cue to indicate the optimal release point, there was some guesswork involved. Even with relatively consistent timing and good three-point ratings, the dice roll for shot success could be unkind, especially on the higher difficulty settings. Of course, it was a little easier without any defense, and on a lower difficulty, perfect scores of 30 were very feasible. Despite the fact it could get a bit repetitive after a while, the three-point contest was a game changer for NBA Live. It was a new mode of play, one of the first big additions outside of the standard set of modes and features. Back then, most NBA games had a regular season mode that included the Playoffs, a standalone Playoffs mode, and an exhibition/single game mode (what’s usually called Play Now these days). Additions like the three-point shootout and GM Mode started to expand upon the experience that NBA Live was offering, thus becoming the first steps towards the deeper games we’ve now come to expect. It was the start of a very innovative era for the NBA Live series. At the time though, it was just fun to set up a few shootouts, either taking on a few friends, or the CPU. I enjoyed challenging myself to get a perfect score on each difficulty level, or seeing how many threes I could make with Shaq and other players who weren’t three-point shooters. The fun continued through NBA Live 99 and NBA Live 2000, with the addition of commentary from the late Don Poier. Unfortunately the mode didn’t make the cut when the game was rebuilt in NBA Live 2001, and it wouldn’t be until the introduction of the full All-Star Weekend mode in NBA Live 2005 that we were able to play the annual shooting exhibition in EA’s game. Later incarnations of the mode added more in-depth presentation, such as multiple camera angles, and special commentary from Ernie Johnson and Kenny Smith (with Smith later being replaced by Greg Anthony). In NBA Live 2005, selected players had their own signature jumpshot forms, a feature that would be dropped until unique jumpshots were implemented across all games modes. Although overshadowed by the dunk contest, the three-point shootout was still fun to play, especially when you could add the trophy to your collection in Dynasty mode. It was also a lot easier to master compared to all the different combinations in the dunk contest. Unfortunately, the All-Star Weekend has been missing since NBA Live 09, meaning it’s been a while since we could participate in the dunk contest or three-point shootout. Both events are present in NBA 2K’s MyLEAGUE, MyGM, and MyCAREER modes, but they’re a little clunky in my opinion, and can’t be accessed for exhibition play. The great thing about the original three-point shootout in NBA Live, and later the full All-Star Weekend mode, is that you could play it at any time. Whether you wanted to practice for an event in your current season, or just felt like playing those events, you could jump right in. No need to start a new game and simulate through to February. That’s what we need to have in both games moving forward: representation of the All-Star Weekend events outside of the other game modes. The All-Star Weekend is a big part of the NBA season after all, and those events are something that I know many of us would like to play at any time. Their presence rounds out the experiences on offer, providing a quick game that’s a lot of fun when you’re in the mood for it. 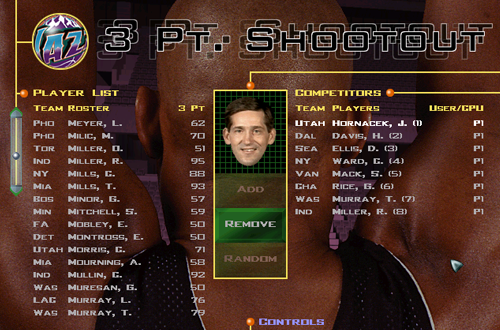 It all started with NBA Live 98, and the first proper representation of the three-point shootout. We may not have realised it at the time, but it turned out to be a very important addition, paving the way for more modes and content outside of the traditional experience. I remember it easy to score a point when you release button while before player reach maximum height. It works also in other NBA Live’s. Once you master the timing, a perfect score of 30 is definitely within reach.